Coronary artery disease (CAD) occurs when the blood vessels that transport blood to the heart are narrowed and hardened due to plaque buildup (atherosclerosis). This narrowing compromises the flow of nutrient-rich, oxygenated blood to vital organs which can lead to stroke, heart attack and death. In fact, coronary artery disease is the leading cause of death among American adults. As such, detection are treatment are at the forefront of relevance. The photoplethysmograph (PPG) waveform has profound prognostic value for coronary artery disease. Studies show that fluctuations measured in photoplethysmograph (PPG) amplitude are directly related to coronary artery disease (CAD) and present powerful predictions of risk. Photoplethysmograph (PPG) is measured using a non-invasive, radiation-free platform. 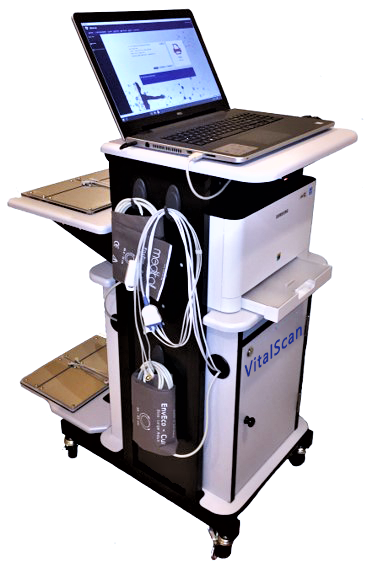 This proprietary test system was developed by BioScan and utilizes a biosensor finger probe to collect data. The patient is then asked to perform a series of controlled breathing exercises. The coronary respiratory response (CRR) is derived from spectral analysis of the PPG signal during instructed breathing. Coronary artery disease is the most common form of heart disease. The condition arises when plaque accumulates along the inner lining of arteries. The plaque accumulation causes arteries to narrow and harden which, in turn, reduces blood flow to the heart. While these blockages can occur anywhere in the body, it is most common in larger arteries (i.e. coronary) arteries. According to the Center for Disease Control and Prevention, heart disease is the leading cause of death for both men and women. More than 17 million adults in the U.S. are afflicted with CAD and the disease is projected to cost the U.S. over $500 billion in health care services, medications, and lost productivity. The most widely used non-invasive method of testing for coronary artery disease is a cardiac stress test which utilizes electrocardiography and blood pressure monitoring. While effective, stress tests can be expensive, time consuming and may expose patients to high volumes of ionizing radiation. For this reason, stress tests are not always available nor are the preferred diagnostic tool. Studies demonstrate that respiratory rate affects the respiratory component in the systolic blood pressure variation. An assumption can be made that at the most influential respiratory rate of 0.1 Hz, the effect of the respiratory modulation of the PPG signal is maximized. Researchers determined that conditions affecting pressure, flow and wave propagation (e.g. myocardial ischemia) will induce fluctuations in the PPG signal. It follows that coronary respiratory response (CCR) is a non-invasive parameter which offers predictive potential for significant CAD. It indicates relative change in respiratory modulation of the PPG signal in response to controlled breathing exercises at 0.1 Hz. Therefore, the diagnosis, and subsequent resolution, of Significant Coronary Artery Disease (S-CAD) has been advanced significantly by BioScan. The BioScan coronary artery respiratory assessment (CRA) enables cardiologists to detect early-stage CAD in order to prescribe treatment, lifestyle changes and pharmaceutical interventions. 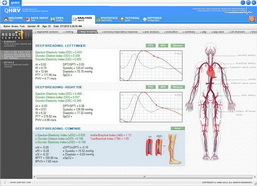 BioScan CRA testing can easily be performed in a standard office, hospital or clinic setting. Readings are obtained non-invasively at a low cost and low risk to both patient and health care services. Measurements are processed into reliable and reproducible results made available to the specialist using a secure online platform. Coronary artery disease is the most common form of heart disease and the number one cause of death and disability in adults worldwide. Early detection and diagnosis offers great potential for treatment. The photoplethysmograph (PPG) waveform has profound prognostic value for coronary artery disease. The PPG signal is obtained through a biosensor affixed to the fingertip. Fluctuations in the PPG signal represent changes in blood volume may indicate variations in perfusion. The pulse waveform is induced by a combination of the pressure wave and respiratory sinus arrhythmia produced by controlled breathing exercises. In addition, the resultant waveform is affected by arterial elasticity and sympathetic tone. Research has suggested a compelling correlation between central arterial properties, haemodynamic parameters derived from peripheral pulse wave analysis and the severity of coronary artery disease (CAD). It has been observed that irregularities in peripheral wave amplitude (PWA) are related to the presence of atherosclerosis and may also predict potential for future cardiac events. The non-invasive tests currently used to test for coronary artery disease are typically time-consuming, expensive, sophisticated and may expose patients to undue ionizing radiation. 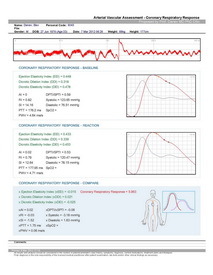 It has also been suggested that respiratory maneuvers and imposed circulatory tests be used in diagnosis. BioScan coronary artery assessment uses non-invasive, affordable technology to deliver reliable results. CRA findings are consistent with those produced using the Mueller maneuver. The Mueller maneuver hypothesizes that acts to increase afterload are placed on the left ventricle. This method involves an attempted inspiration with closed mouth and nose following a forced expiration, which leads to sub atmospheric pressure in the chest and lungs. Findings suggest that in patients with CAD, the ejection fraction is significantly lower than in normal subjects. 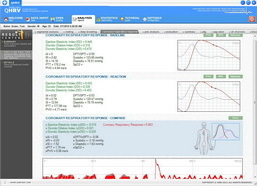 In patients performing controlled breathing exercises, cardiovascular physiological measurements exhibit fluctuation in synchrony during respiration with a peak effect at the breathing frequency of six breaths per minute. Also noteworthy is that reduced heart rate variability of 0.1 Hz for a minute during the exercise is a powerful predictor of cardiovascular events after acute myocardial infraction. In addition, facets of heart rate recorded using electrocardiographs using controlled respiration levels of 0.25 Hz shows a significant correlation to angiographic severity of coronary artery disease. BioScan has extracted important elements form all of these tests and distilled them into a simple and effective platform. The test is performed non-invasively during a 60 second deep breathing exercise at a pace of 0.1 Hz. The resulting measure is an inclusive and highly innovative test which uses photoplethysmography (PPG) pulsewave (PW) to derive important prognostic data.